We-cycle employee Eric Tierney checks in a bike to the kiosk on Hopkins Avenue and Mill Street on Thursday morning. Ridership has soared in the three weeks that We-cycle has been in operation for the season, thanks to the bike-sharing program going to a no-fare system. 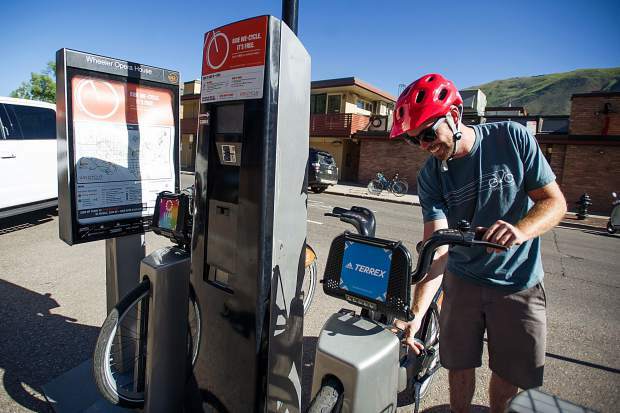 Since May 7, ridership is up 197 percent in Aspen and 44 percent in Basalt during the same time period last year, reported Mirte Mallory, executive director and founder of We-cycle. “It’s amazing what free can do,” she said. Mallory added that getting multi-year financial commitments from government agencies are game changers for the nonprofit. The Elected Officials Transportation Committee, which is comprised of the city, Pitkin County and Snowmass Village, committed $100,000 this year and in 2019. The Roaring Fork Transportation Authority also is kicking in $100,000 annually for three years. The city of Aspen upped its contribution to $145,000 this year, and the town of Basalt and Eagle County each contributed $45,000. Mallory said being able to offer the first 30 minutes free makes messaging much more simple. It’s also showing that it’s enough of an incentive for people to sign up for a season pass — 1,500 people have already. There are 190 bikes in the system, and Mallory said she is seeing over 200 rides a day. In the Basalt area, most of the usage occurs from neighborhoods to park-and-ride lots, so people are finding that We-cycle works for them when it comes to taking the bus. Others are using We-cycle as part of their carpooling plans, Mallory said. The city of Aspen’s increased contribution aligns with its subsidy for free bus service on in-town routes and the Downtowner. We-cycle has come a long way since it was introduced six years ago. Aspen and Basalt are the first municipalities in the country that have free bike-sharing programs. Three new dock stations have been added to the Aspen system, making it a total of 23. There’s a new one at the kiss-and-ride area by the roundabout, as well as one on the north side of Main Street on Fourth Street and another near the Hotel Aspen. The most used station in Aspen is near Rubey Park, with the second being the one near City Hall on the corner of Galena Street and Hopkins Avenue. Mallory said she anticipates adding 10 more bikes in Aspen and another 10 in Basalt this summer. She reported to Aspen City Council last fall that there were 34,100 rides in Aspen in 2017 and more than 42,000 rides system wide.